This lecture thoroughly elaborates on Composition of Extracellular Matrix. In section one, the educator primarily focuses on the Composition and Role of Extracellular Matrix. The topic of Composition of Tissues is addressed in the beginning. Subsequently, the educator speaks about The Matrix. Furthermore, Role of Matrix is highlighted followed by an elucidation of Overview of Matrix. Section two is about Macromolecules. In this section, the educator deals with the explanation of ECM Production by Cells. Later, light is shed on Macromolecules of ECM and Variability of ECM. Moving forward, the The Proteoglycan Molecules are highlighted followed by a discussion on The Collagen Fibers. The educator then brings Matrix Glycoprotein under consideration and puts forth a description of Glycosaminoglycan (GaG) Chains. Afterwards, light is shed on Groups of GAGs in addition to GAGs Structure and Function. At the end of this section, Defects in the Production of GAGs are brought to light by the educator. In section three the educator talks about Types of GAGS. First of all, the Simplest Form of GAG: Hyaluronan is elucidated in detail. Furthermore, the Role of Hyaluronan is discussed extensively. Apart from this, the educator focuses on the description of Formation of Proteoglycans and deals with the clarification of the concept of Proteoglycans vs Glycoproteins. For a greater understanding, light is shed on the Examples of Proteoglycans. The educator concludes this section by addressing Plasma Membrane Proteoglycans and Syndecans. Section four focuses on Collagens. At first, the educator puts forth an overview of Collagens. Afterwards, various aspects of Collagens are highlighted such as Primary Features of Collagens and Types of Collagens. Furthermore, light is shed on Fibril-Associated Collagens, “Collagen-Like” Proteins, and Secreted Fibril-Associated Collagens. Section five gives information regarding Interaction with Fibroblasts. The prime focus of educator in this section is the elucidation of Organization of Collagen Fibrils. After this, the explanation of how Fibroblasts Interact with Collagen takes place. Subsequently, light is shed on the In Vitro Experiments. 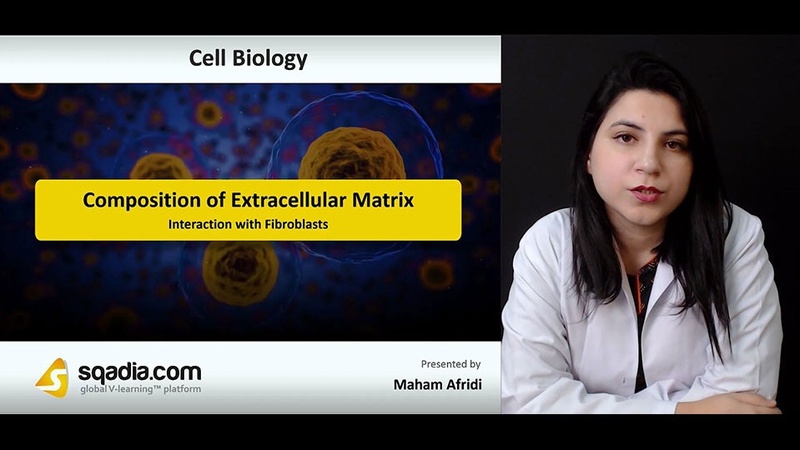 At the end of this section, the educator elaborates on how Fibroblasts Organize ECM.